Milwaukee Bucks guard Luke Ridnour dives after a loose ball during the first half against the San Antonio Spurs at AT&T Center. Milwaukee Bucks guard Luke Ridnour left Sunday night’s game in San Antonio after spraining his right wrist late in the first quarter of a 110-82 loss to the Spurs. Bucks coach Larry Drew said X-rays were negative, but that Ridnour would likely have an MRI to determine the extent of the injury when the team arrives back in Milwaukee. 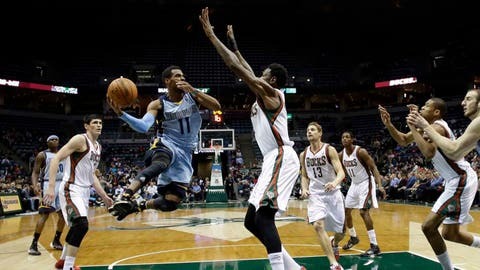 Ridnour was injured when he got his right hand caught in between Ekpe Udoh and the player the Bucks forward was trying to screen. He left the game at the conclusion of the first quarter and did not return to the game. "It did look kind of serious," Drew said. "I don’t know exactly what happened on the play, but he said it swelled right away. I saw him at halftime and it was pretty swollen. "Right now it looks like he’s in a splint. I don’t know how long he will be out. It swelled right away, as soon as he did it. That was a big concern." If Ridnour is out an extended period of time, opportunity could knock for guys like Nate Wolters and Gary Neal, two players who have been seldom used of late. Neal got in Sunday for the first time since the verbal argument with Larry Sanders in Phoenix on Jan. 7, but scored just three points on 1-of-8 shooting in 18 minutes against the Spurs. "That’s how we’ve been doing it all year," Drew said. "We’ve had some injuries. We’ll just have to slide some guys in. Hopefully Luke’s injury isn’t that serious where he won’t be out a long time, but we’ll have to plug some guys in during his absence." Wolters, who hadn’t played meaningful minutes since Dec. 28, played the entire fourth quarter and was aggressive. The rookie scored nine points with three assists on 3-of-7 shooting. "That’s the thing that’s really intriguing about Nate, he just goes about his business," Drew said. "He’s a tough little competitor. He can get into the paint amongst the trees knowing he’s going to get hit, but he still competes at a high level. That’s what we really like about him. He’ll sit over there and wait his turn. He’s not a complainer. When his number is called, he’ll do what he did tonight." Spurs continue to roll: With one future Hall of Famer sitting out, another scoring just 11 points and a key reserve kicking in one point, San Antonio still managed to beat the Bucks by 28 points. The Spurs had seven players score in double figures Sunday, including reserves Nando de Colo, Jeff Ayres and Patty Mills scoring well above their average. San Antonio’s bench combined 58 points in the rout. "They are one of the top teams in the West," Drew said. "It’s no fluke. When you walk into that arena and you see those championship banners, there’s a reason. They are just a really solid basketball team. They can beat you inside, they can beat you outside. They move the ball extremely well. They have a lot of ways they can beat you." Milwaukee has now lost nine straight games and is on the verge of a double-digit losing streak for the second time this season. The Bucks are obviously well behind the Spurs in a lot of areas, but Drew is hopeful his young team can see the unselfish way San Antonio plays with and learn from it. "They can take a step back and look at how these guys play, the pace in which these guys play, how they do things as a team," Drew said. "(These are) things we are hoping can rub off on our guys."